In Windows, you can change the template, column width, Group by, Sort by, and layout view of the content of your folders to how you like. This tutorial will show you how to backup and restore folder view settings for any account in Windows 10. This .bat file will only apply a backup and restore for the current account. echo 1. Back up your folder view settings. echo 2. Restore folder view settings from backup. set /P c=Type the option number you would like to do, and press Enter? echo You already have a "Folder View Settings Backup" folder on your desktop. echo Please move it to another location, and try again. mkdir "%userprofile%\Desktop\Folder View Settings Backup"
echo Backup of folder view settings successfully completed. echo You do not have a "Folder View Settings Backup" folder on your desktop. echo Please place the backup folder on your desktop, and try again. REG IMPORT "%userprofile%\Desktop\Folder View Settings Backup\HKCU_Software_Microsoft_Windows_CurrentVersion_Explorer_Streams_Defaults.reg"
REG IMPORT "%userprofile%\Desktop\Folder View Settings Backup\HKCU_Software_Microsoft_Windows_Shell_BagMRU.reg"
REG IMPORT "%userprofile%\Desktop\Folder View Settings Backup\HKCU_Software_Microsoft_Windows_Shell_Bags.reg"
REG IMPORT "%userprofile%\Desktop\Folder View Settings Backup\HKCU_Software_Microsoft_Windows_ShellNoRoam_Bags.reg"
REG IMPORT "%userprofile%\Desktop\Folder View Settings Backup\HKCU_Software_Microsoft_Windows_ShellNoRoam_BagMRU.reg"
REG IMPORT "%userprofile%\Desktop\Folder View Settings Backup\HKCU_Software_Classes_LocalSettings_Software_Microsoft_Windows_Shell_BagMRU.reg"
REG IMPORT "%userprofile%\Desktop\Folder View Settings Backup\HKCU_Software_Classes_LocalSettings_Software_Microsoft_Windows_Shell_Bags.reg"
echo Backup of folder view settings successfully restored. echo Waiting to restart explorer to apply. echo Your screen will flash as explorer is restarted. 4. Run the .bat file. When you create a backup of your folder view settings, a Folder View Settings Backup folder will be saved to your desktop containing the exported .reg files from the registry for your folder view settings. 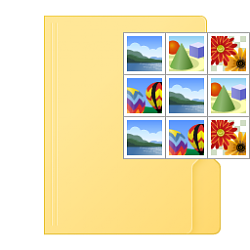 You can save this folder where you like for safe keeping. When you wish to restore a back up of your folder view settings, you will need to first have the Folder View Settings Backup folder on your desktop with this exact same name to do so. and after that i ll make a clean install windows , after I install new windows if i restore this back up as u shown us , it ll return all folders sorts & views as I took before ? even i dont change the rename of this folders ? It will only restore the folder views to how they were when backed up. It will not rename or create folders. I see, but I mean now i must make clean install of windows 10 , and I ll re install a new one , i ll not change any folder name . i mean that if i restore this back up after clean installation of windows it ll return back the folders sorts and views i made before ? The backup will only be able to restore the folder views of the folders that exist now and were included in the backup. If the folders are not the same, then their folder views will not be restored since they were not included in the backup. This sounded like the solution to my disappearing settings on my Acer laptop -Other laptops don't have this problem. After removing "Type" and ordering name, date, size for "General Items"and "Documents", I ran the restore operation. The next day after waking/rebooting it's back to the original settings - but the Restore function does not change it back. First, why can't Windows remember these settings, and why does your batch program not work on my system? When you tried to restore your backed up folder view settings, did you do this below first? Just have to verify. REG IMPORT "%FFF%\Folder View Settings Backup\HKCU_Software_Microsoft_Windows_Shell_BagMRU.reg"